It's my mom's birthday today and it's safe to post this card now because I know she has received it. 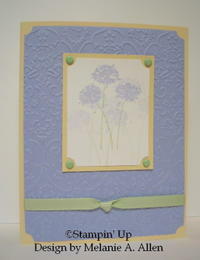 I chose Barely Banana and Almost Amethyst card stock in order to achieve a feeling of spring. The green brads and ribbon are both Certainly Celery. I embossed the amethyst card stock using the Textile Cuttlebug embossing folder and then cut the corners using the ticket corner punch. 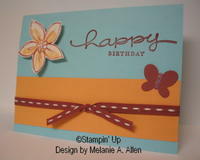 I chose the flower stamp from Happy Harmony (such a cute set) as the focal image. I stamped the main image and then stamped it twice again without re-inking to get a second and third generation image. This technique produces a lighter image each time you stamp since you don't re-ink between stampings. It's somewhat difficult to see in this photo unless you click on it to view the larger image. If everyone is well by Saturday (Bill has the flu and Lisa has strep throat), we are going to dinner to celebrate. Happy Birthday, Mom! 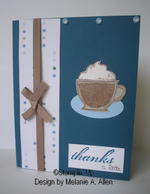 I created two cards this weekend for submission to a stamping magazine. The rejection rate is really high so I'm not getting my hopes up, however, these two cards are really, really cute (at least in my opinion...hee hee hee) so maybe I'll have a shot. This is the first time I've submitted any of my creations. I have to wait quite a while since they won't make a decision until May 14. I'll let you know either way, but if they don't choose my cards, I'll be sure post them on my blog. We ate at 61 Roadhouse on Friday. It's the new restaurant in the old Ellie Forcella location. It felt so familiar yet so different. The tables and booths are arranged in a new configuration and the menu is completely different from Ellie's but it is quite good. We had the fried tamales and french fries with gorgonzola sauce for appetizers. I had the muffaletta sandwich for dinner and Bill had the black and blue steak sandwich. They had quite a few good brews on tap. I had a Springboard which is the new seasonal from New Belgium Brewing and the O'Fallon 5 Day IPA. Four years ago today, our dear sweet Maggie went to kitty heaven. Bill & I had adopted her from the Humane Society on September 1, 1986. She was about a year old at the time and was 17 1/2 when she died. She had broken a bone in her leg in November 2002. To this day, we have no idea how she did it but the vet had said it was probably brittle bones caused by age and her thyroid medication. 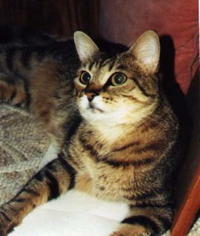 She never fully recovered and suffered what the vet believed was a stroke on the morning of February 22, 2003. I've been hoping and wishing for Spring and I figured if I made a card with a spring feel, maybe spring would be just around the corner or, at the very least, it would put me in a spring mood. I chose Cool Caribbean as the base with Marigold Morning and Cranberry Crisp as the accent colors. It's hard to see in the photo but both the center of the flower and the body of the butterfly sparkle with Dazzling Diamonds glitter. I originally made the butterfly entirely sparkly, however, it detracted from the overall layout. I added the stitched ribbon to complete the design. I designed this card on Sunday and my plan must have worked. It's been getting warmer and warmer each day. It was 61 degrees so I drove home this afternoon with the top down. I have a slight cold and a nagging cough but hey, I certainly couldn't pass up the opportunity. I know, I know. I really need to post some more of my current creations. I've been making quite a few cards lately but it's taking a while to photograph them. Once I get a an acceptable photo (and believe me, this is harder than it sounds due to lighting, color variances, etc) I then have to put the copyright on it and decide which ones to post first. I can't post the cards that are for specific individuals who read this blog or else they will see their birthday, anniversary, Easter cards, etc. before they actually receive them. The weather was really nice yesterday and today. It was 58 yesterday and 56 today. It's supposed to be a little warmer tomorrow and 62 by Saturday! My tulips are starting to make an appearance. Woohoo...I can taste Spring! August so it was especially nice to eat there again tonight. I just realized that I haven't posted very much to my blog lately. I think I've been away...at least my mind has been away. It's been in a warm, tropical, sunny place. I don't want to see any more snow. It needs to go. We got about 4 inches on Tuesday (along with a little ice) and it's snowing again now. It's been super cold so nothing has melted. We're supposed to get 1 to 3 inches tonight. Oh well, at least it's the weekend and I don't have to worry about driving to work. Whoever is wishing for snow needs to stop right now. Remember, you might just get what you wish for and, in this case, that's not a good thing! Where or where is Spring? I can't imagine anyone not liking chocolate. What's not to love? Click here to learn your chocolate IQ. I scored 8 out of 10 which means I'm "hot chocolate"...hee hee hee. We're supposed to have wicked winter weather tomorrow so I may be taking a vacation day. If I do, I'll have a chance to upload more of my creations. I can't stop playing with this stamp set. I absolutely love it. As I've said before, I don't even drink coffee but this is such a fun set. I created this first card using Close to Cocoa and Real Red card stock. The "friendship" stamp from Wonderful Words just seemed to fit perfectly in this design. The heart is edged with Dazzling Diamonds. The addition of the marshmallows and the two straws make this a steaming cup of hot chocolate to be shared. I created this second card using Ruby Red and More Than Mustard card stock. 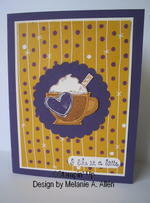 The heart and the foam on top of the latte were made using shimmery white card stock. It has a little bit of sparkle to it (and we all know that sparkle is a good thing). I considered adding ribbon to the design but settled on eyelets instead. Barely Banana was a color that I didn't use too often but I seem to be using it quite a bit lately. Pixie Pink and Sage Shadow (another color that I seem to be using more and more) are used as accent colors. I don't think I would have put these three colors together on my own, however, the Color Coach (a color wheel sold by Stampin' Up) showed these three colors together and I thought, "What the heck, I'll give it a try." Since I liked how the "friendship" stamp looked on the first card, I decided to use the "Thank You" stamp from the same set on this card. I certainly do Like It A Latte. 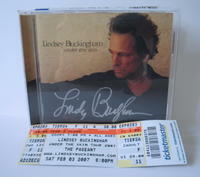 We saw Lindsey Buckingham at The Pageant last night. Granted, we've seen him many times with Fleetwood Mac, but this was the first time we had seen him solo. In addition to songs from his new album, Under The Skin, he sang old favorites such as Go Your Own Way, I'm So Afraid, Tusk, Second Hand News, World Turning, Go Insane and Holiday Road. It was a great concert! Even though we already have his new CD, I bought an autographed one after the concert. We had planned to eat dinner at Blueberry Hill but the wait was too long so we walked across the street to Riddles Penultimate. We've never eaten there before but it had been on our list of restaurants to try. We had the andouille sausage for an appetizer and then I had the white bean and andouille soup (think of regular bean soup but instead of ham, they use andouille) and the spinach lasagna. Very good! Even though it's a "wine bar" they have a wide selection of bottled beers as well as beers on tap. I tried the Five Day IPA which is made by O'Fallon Brewery, a local brewery in O'Fallon, MO. The IPA was true to style, very hoppy. I enjoyed it. It's so cold outside today. The wind chill is zero...yes, I said zero! Yikes. There are snow flurries floating through the air right now. It's a good day to stay inside! We'll be watching the Superbowl tonight. I don't watch the game unless the Rams are playing. I just watch the commercials. Tonight while I was stamping, Bill was watching The Producers again (Springtime For Hitler cracks me up). When it was over, he told me to watch the credits. We had never noticed this before (we've watched The Producers several times) but, lo and behold, I'm in the movie! Look at the first name on the list (click on the picture for a close up view). It's me! Woohoo...I'm a star. I don't like the fact that I'm listed as a "Little Old Lady" though. I'm not old!